In 2006 the Root Institute Shakyamuni Community Health Care Centre, India was working on a project in a nearby village, and asked Rinpoche for advice regarding the safety of the people/workers going to that village. 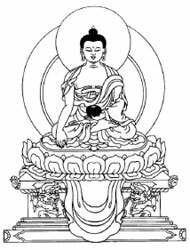 “It is important that whoever goes keeps Golden Light Sutra and Diamond Cutter Sutra actually on their body for protection” (meaning to print very small, wrap in a cloth and wear as a protection on the body). Again in 2010, a student asked Rinpoche for advice regarding safety as she was alone and in some dangerous situations. Again Rinpoche’s advice was to wear the Vajra Cutter Sutra and the Sutra of Golden Light. The small size Vajra Cutter Sutra is available in Tibetan here.